ROC GP500 Grey Nylon Knit Gloves with black NitriX grip technology palm coating are manufactured from a 100 percent nylon, high-density, 13-gague seamless machine-knit shell. 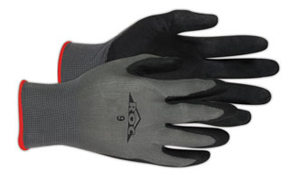 The gloves are designed to provide coverage and grip in oily conditions. They are available in sizes 6-11 and feature a knit-wrist cuff with a color-coded rubber band overcast finish to reduce fraying.